Social media as an advertising and promotion platform is practically solid gold for businesses. The reason is because they've spent the last several decades in print media. Print media is not only expensive, but it's hardly trackable. You can slap a unique promo code in a commercial or on a magazine, but so much of that tracking is up to the advertising Gods. On Twitter, like most social networks, you have a bigger advantage than print and radio. You have a paper trail or a Tweet trail ... a URL trail, maybe. In any case, any URL can be tracked right straight back to your analytics or any analytics tracking package. You could simply attach a unique code to your URL and track it directly in Google Analytics, or you could send all of your Tweets through a program like Hootsuite, which tracks them all for you. Or, you could use a host of other analytics tracking tools that help you further analyze everything you send. This part, the analytics part, is a great part of social media. You can construct ten different headlines for a Tweet, schedule them out over the course of a day or ten days, and find out fairly quickly which headline worked best. You can try sending the same Tweet at different times of the day to see which time is more effective. You can see which type of Tweets work best with your readers. There's so much you can learn about your followers, completely free, that you would have waited months for in print and radio. To get the most out of Twitter, you have to know what is and isn't working for your business. And you can use one or more of these Twitter tools, most of which are free or at least have a free trial period. 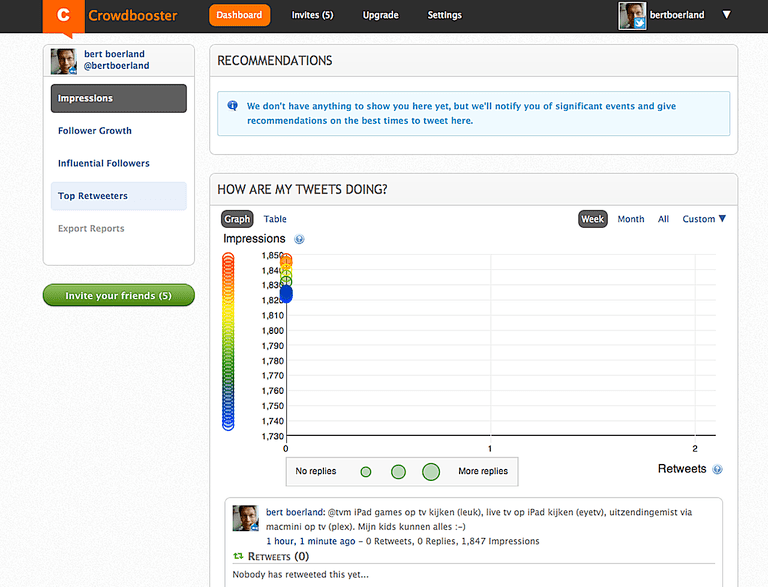 TweetReach — This measurement resource is great for determining how far your Tweets are going. Just input your URL and you'll get a clear picture of how far your reach is spreading. Twitter Counter — If you want a straightforward tool that can measure your growth and compare it with that of your followers, this analytic tool will do the trick. Social Bro — Speaking of your followers, how about getting some stats on their followers. This is a very powerful tool and has a lot to offer free-of-charge. Twitonomy — If you want to know about your conversions, this is the metric for your business. It packs a big punch and allows you to identify things which matter to your business most. Twtrland — For those who don't like a lot of numbers, percentages and other figures, this is the application for you. It produces visuals and puts the stats into groups for easy reading. By-and-large, many of these free Twitter analytics tools do the same things. And while that seems like nothing less than redundant, there's an application which fits your social media strategy best. You might also identify with a different interface than someone else would. Analytics are complicated enough, so choose a platform that makes you comfortable. The best thing to do is take a look at each of them and decide which one strikes a chord. Then, give a few a try and that will tell you precisely which one or two you find most informative and easy to use. They're all designed to deliver a simple interface but ultimately, the end user decides which is the best match.